Los Angeles County Sheriff’s Homicide Bureau Detectives are still continuing their investigation into the circumstances surrounding a structure fire and death of John and Linda Venti. Monday, November 05, 2018, at approximately 8:00 pm, residents in the 3600 block of Crooked Creek Drive, Diamond Bar, called 9-1-1 and reported seeing Suspect Ryan Venti at the home of his parents, on Crooked Creek Drive. Suspect Venti was wanted for the murder of his parents and the arson of their home. Deputies responded and were able to take the suspect into custody without incident. From the condition of the suspect it appears that he has been hiding in the surrounding hills and brush in an attempt to avoid capture. The suspect was booked at Walnut Sheriff’s Station for murder and is being held in lieu of $2,000,000.00 bail. The booking photo is not being released. 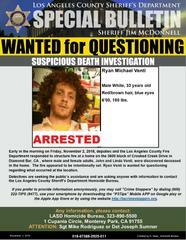 Los Angeles County Sheriff’s Department Homicide Bureau Detectives are seeking the public’s assistance in locating Ryan Michael Venti, who is wanted for questioning regarding a structure fire which occurred on Friday, November 2, 2018 on the 3600 block of Crooked Creek Drive, Diamond Bar, CA. Deputies from the Walnut/Diamond Bar Sheriff’s Station along with the Los Angeles County Fire Department responded to a structure fire, where a male and female adults, John and Linda Venti, were discovered deceased in their home. The fire appeared to be intentionally set. Ryan Michael Venti is wanted for questioning regarding what occurred at the location. Ryan Michael Venti is a 33 year old male White with red/brown hair, blue eyes, 6’00 and 180lbs. Detectives are seeking the public’s assistance and are asking anyone with information to contact the Los Angeles County Sheriff’s Department Homicide Bureau at (323) 890-5500. If you prefer to remain anonymous, you may call “L.A. Crime Stoppers” at 800-222-TIPS (8477), use your smartphone by downloading the “P3 MOBILE APP” on Google play or the App Store, or use the website http://lacrimestoppers.org.